Posted February 26, 2018 by greendog & filed under Charitable Giving, events. Woo Hoo! What we do want to shout from the rooftops is how awesome our customers are for donating this food to the Pongo Fund, and what a fantastic job the Pongo Fund does to help people and pets in need all over Oregon, from food to lifesaving veterinary care. The most important thing they offer is dignity, recognizing the humanity in every person, understanding that asking for help is often difficult, and that life can deal unexpected blows. Most importantly, that a pet is so often a lifeline for people who have very little else. We want to keep people and pets that love and rely on each other together, and we couldn’t help to do that without the generosity of our wonderful customers. This year’s drive resulted in almost 3,000lb of food – that’s a ton and a half! Thanks y’all! Hint: It’s not the truck. This photo speaks volumes, Pongo volumes, that is. Your eye goes to the bright Ryder logo, right? But that’s not it. 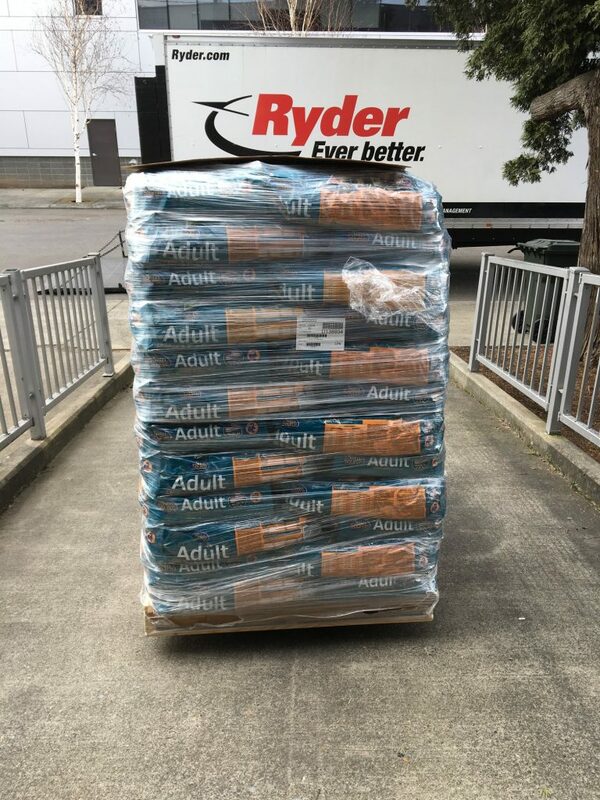 No, it’s the pallet of NutriSource Pet Foods coming up the ramp. That’s the big deal here. And that’s just one of dozens of pallets donated by Green Dog Pet Supply over the years, literally tens of thousands of lifesaving meals they’ve given, thanks to their pet food drives and their generous customers. With a big assist from Nutrisource and Animal Supply Company too. Like the pallet, Green Dog doesn’t grab for attention. They make a difference quietly, respectfully; doing what they can without shouting that they did it. And that’s why we love them. Because The Pongo Fund does it like that too. Simply, respectfully, quietly, always focused on making a difference. Because doing it is more important than talking about it. With our Pet Food Bank that’s provided more than 10 million high-quality meals or with our Emergency Kibble Response Team that hits the road near and far or with our Lifesaving Veterinary Care Team or with our Pop-Up Pongo Team, we do our best to save lives and keep animals safe in their homes and out of the shelters. We’ve helped more than 100,000 animals since we began this effort a little more than eight years ago, Saving lives and keeping animals out of shelters; keeping pets and their people together, that’s our thing. And we thank you, because we couldn’t do it without you. And this is why we Pongo.